Built with quality in mind, the American made Phoenix SD complete outdoor cooking system is easy enough for a beginner to use and has enough features for the serious griller. The SDRIVDDN riveted style grill is designed to let you do it all: grill, roast, steam and smoke. Each side of the stainless steel, oval-shaped dual burner is controlled individually and together provides up to 25,000 BTUs of precise heat. The solid brass dual valve allows you to adjust your grill as low as 250 degrees for slow cooking, or turn it up to 500 degrees for high heat grilling. The adjustable vents on the top of the grill allow you to maintain and control the air flow while cooking. For steaming, close the drain valve, fill the cast aluminum drip pan that sits above the burner with liquid of your choice and set the burner to high to steam vegetables or seafood. The heat rises around the drip pan, making it virtually free of flare-ups. With the electric ignition with stainless steel gas collector box, you can easily light the grill using one AAA battery. The stainless steel diamond pattern cooking mesh grid provides 400 square inches of cooking space and prevents food from falling through. The stainless steel grill head is riveted for added durability and has a Sta-Kool swiveling stainless steel handle to easily and safely open the lid, the hood has stainless steel heat indicator to monitor temperatures. The stainless steel cart includes two stainless steel side shelves with tool hooks and two 8-inch rubber wheels. Clean up is easy with the cast aluminum drip pan and collection bucket. Also included is a 12 foot hose with quick disconnect coupler. 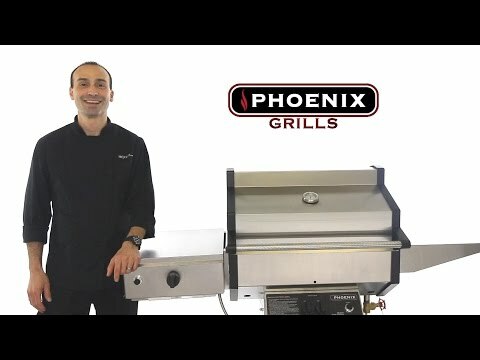 Phoenix riveted SD grills have a limited 10 year warranty against rust-through covering the grill top and bottom, control panel, stainless steel column and base, side shelves, cooking grid and cast aluminum drip pan. The ignitor system, gas valves, knobs, wheels and casters are covered by a 1 year limited warranty against rust-through. Does the grill come preassembled or do I have to assemble it? Great question, Dave! Assembly is required for the cart.